Nik Lentz is already looking at taking the UFC title. Nik Lentz is not a fighter who will ever be told he lacks confidence in the conviction of the statements he makes. Since moving down to the featherweight division, Lentz is unblemished with a perfect 3-0 record and when opportunity knocked for him to take a fight against the No. 1 ranked fighter at 145 pounds in his hometown he didn’t blink. As a matter of fact, while several other featherweights turned down the fight, Lentz jumped at the chance to face Chad Mendes in Sacramento because not only would it get him closer to a title shot, but it’s a matchup he was ultra positive he’d win. "This was the plan, this is the kind of fight we wanted," Lentz told FOX Sports on Wednesday. "For the past experience and how well I was doing at 145 pounds we knew we wanted a top ten or a top five guy. This came up and a lot of guys in the top ten turned it down which made me ecstatic because I was all about it." Lentz heard that quite a few fighters weren’t as quick as he was to face Mendes, but there was no chance he was backing down from this challenge. If he earns a shot at the featherweight title, Lentz wants to know he earned it and didn’t skate by on lesser opponents like he believes some other fighters might be apt to do. I want to be the No. 1 guy in the world and I don’t mind if I have to beat the No. 1 guy to do it. "A lot of people are worried about their records nowadays. They’re worried about having that perfect run. They want it to be as easy as possible," Lentz said. "I want to be the No. 1 guy in the world and I don’t mind if I have to beat the No. 1 guy to do it." 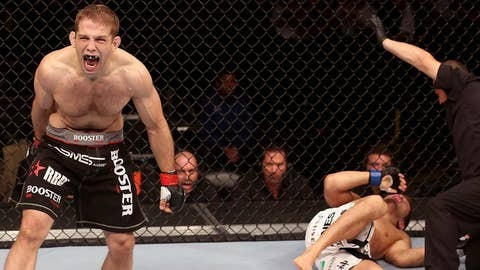 As far as Mendes goes, the Team Alpha Male fighter has steadily built a reputation over his last few fights as a prolific striker with knockout power in both hands. He’s finished four opponents in a row by knockout or TKO, and his seemingly unstoppable run may explain why some fighters weren’t itching to pull the trigger and sign up to face Mendes in the Octagon. Lentz looks at Mendes’ recent run in a completely different way. He sees names like Cody McKenzie and Clay Guida and says part of Mendes’ wins of late have something to do with the kinds of opponents he’s facing and not nearly as much to do with some sort of savant boxing skill he’s picked up lately. "Some of it’s the competition he’s been fighting, some of it’s not as high level as some of the other guys that are in the division," Lentz explained. "Some of it is he’s gotten better, he’s gotten a little more accurate with his boxing, a little more technical but it’s not like he’s turned into Roy Jones or something. His striking has not improved that much." I would have smashed every one of them. And if you’re curious how Lentz believes he would have done against those same four fighters that Mendes knocked out? "I would have smashed every one of them," Lentz said. Lentz is hopeful that a convincing win over Mendes in his hometown of Sacramento on Saturday night will not only mark his fourth win in as many tries since moving down to featherweight, but also propel his name into title contention against the winner of the UFC 169 co-main event between champion Jose Aldo and top contender Ricardo Lamas. While Lentz admits that he will happily face whoever holds the belt, there would be something special about being the fighter to finally dethrone Aldo after all these years. He’d even volunteer to take the fight in Brazil – a country where he’s twice entered as the visiting foreigner and walked out a winner. "That’s why I took it. If Chad didn’t have that No. 1 contender’s thing next to his name I wouldn’t have taken it. That’s the whole purpose is to get the shot and beat (Jose) Aldo," Lentz said. "What better way to win the world title than to beat one of the best there’s been. I want to beat the best pound-for-pound fighter in the world. I don’t want him to lose that belt until I take it from him. I’ll beat him in Brazil and then be the only (American) to win three times in Brazil."